›› Check Subscription – If you need help call 800-844-1197 (domestic) or 701-255-1197 (foreign) with any questions! Please disregard any notices from Escondido, CA. Our mailing address has been moved to PO Box 7301, Bismarck ND 58507. All renewal notices should be mailed to the North Dakota address or quickly renewed online (Renewal Code was previously called INET or Customer Number). Send emails to VGuitar@VintageGuitar.com. Please do NOT email vintageguitar@pscpublink.com or subscribe@vintageguitar.com as they are deleted accounts. Must be purchased directly from the VG Store. The perfect way for your loved one to jump-start his/her passion for guitar. 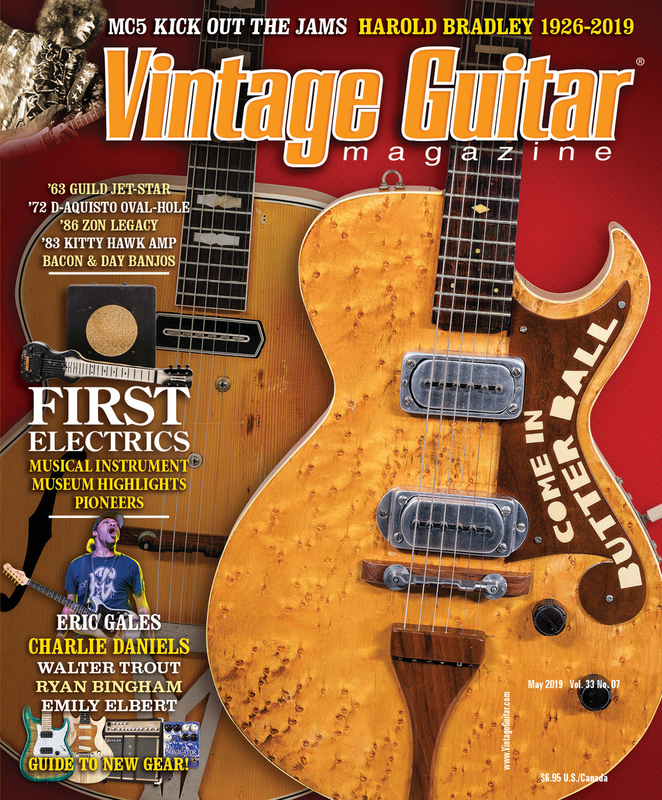 The VG Starter Package includes a 1 Year (12 Month) Print Subscription to Vintage Guitar magazine, a print AND digital copy of our hugely-popular The Official Vintage Guitar Price Guide 2019, and the 2019 Vintage Guitar Wall Calendar. Gift option is available! Temporarily suspend delivery OR replace damaged or missing issues for free when you inform us using the form below. If you are a subscriber living in the U.S. or Canada and have not received your issue by the 20th day of the month, please call us 800-844-1197. If you are a subscriber outside the U.S. or Canada, and have not received your issue by the 30th, call 701-255-1197 or send us an email. Vintage Guitar is mailed around the 1st of each month. If you continue to experience problems with delivery, please contact your local post office. THE VINTAGE GUITAR MAGAZINE APP WILL NO LONGER BE UPDATED WITH NEW ISSUES! Starting April 1st, 2019, Vintage Guitar will no longer add new digital issues of the magazine to our app. You will still be able to view issues you have already received on the app, but we will not be adding new issues to it. Future issues will still be viewable on most devices, but will be streaming exclusively via a web browser. We apologize for any inconvenience you’re experiencing with the online digital issue of VG. We hope this list of frequently asked questions will address the issue.